For obvious reasons DavidTennantOnTwitter.com is careful not to invade David's privacy. However these are some of the events where David has made public appearances (outside of television and stage commitments). Posts related to David Tennant Appearances on Blogger (usually with more detail). Sunday 19th May - Motor City Comic Con fan convention in Novi, MI. Friday 17th and Saturday 18th May - MegaCon Orlando fan convention in Orlando, FL. Saturday 27th April - Wales Comic Con fan convention in Wrexham, Wales. Wednesday 17th April - Good Omens promo events in Los Angeles, CA. Wednesday 27th March - The Big Quiz in London. Saturday 23rd and Sunday 24th March - Chicago Comic And Entertainment Expo (C2E2) fan convention in Chicago, IL. Tuesday 12th March - David Tennant attended The Life I Lead after show party. Tuesday 12th March - David Tennant attended an event at the Science Museum in London to celebrate 30 years of the Internet. Also there were the inventor of the World Wide Web Tim Berners-Lee and the first British astronaut Helen Sharman. Photo of David with Tim and a PR person. Saturday 9th March - Good Omens panel at SXSW Film Festival in Austin, Texas. Thursday 7th March - David Tennant attended the Their World Breakfast in London. Wednesday 6th March - David Tennant attended the BFI Chairman's Dinner honouring Olivia Colman with the BFI Fellowship in Londont. Tuesday 5th March - David Tennant attended the Up Next Gala at the National Theatre in London. Photos here and here plus video here. Sun 3 March - David Tennant at #March4Women in London. Wednesday 13th February - Good Omens panel at TCA in Los Angeles, CA. Saturday 12th January - ACE Comic Con Arizona in Glendale, AZ. Monday 7th January - David Tennant attended the opening night of The Catherine Tate Show Live at Wyndham's Theatre in London. Photo. Monday 10th December - Mary Queen Of Scots UK and European premiere in Leicester Square, London. Thursday 6th December - David Tennant attended the opening night of the play Nine Night at Trafalgar Studios in London. Photo. Sunday 21st October - Oxford Playhouse's 80th Anniversary Gala Show in Oxford. Wednesday 10th October - Camping premiere at Paramount Studios in Los Angeles, CA. Tuesday 9th October - PaleyFest New York in New York City, NY in the evening. Tuesday 9th October - BUILD Series in New York City, NY in the afternoon. Saturday 6th October - Good Omens media day at New York City Comic Con in New York City, NY. Friday 5th to Sunday 7th October - New York City Comic Con in New York City, NY. Tuesday 2nd October - Press panel for Good Omens in London. Saturday 29th September - FACTS fan convention in Ghent, Belgium. Thursday 27th September - David Tennant attended The League Of Gentlemen opening night in London. Photos of him with Peter Capaldi are here and here. Sunday 23rd September - Edmonton Expo in Edmonton, Alberta, Canada. Friday 21st and Saturday 22nd September - Wizard World Comic Con Austin fan convention in Austin, TX. Saturday 8th and Sunday 9th September - Rose City Comic Con in Portland, OR. Thursday 6th and Friday 7th September - FanX Salt Lake Comic Convention in Salt Lake, Utah. Thursday 30th August - Improv show Cookin' With Gas in Los Angeles. Sunday 28th July - London Film And Comic Con at Olympia. Wednesday 11th July - Attended Asia Mackay's book launch for her book Killing It in London. Thursday 5th July - Private screening of third episode of Hang ups in London. Photo. Saturday 16th and Sunday 17th June - Denver Comic Con fan convention in Denver, CO.
Saturday 2nd and Sunday 3rd June - Wizard World Des Moines fan convention in Des Moines, IA. Saturday 12th May - Disneyland Resort for DuckTales. Tuesday 1st May - Screening and panel for Bad Samaritan in Los Angeles, CA. Thursday 7th December - David Tennant and Olivia Colman take part in the Christmas Celebration At Winchester Cathedral charity event. The event is in aid of Breast Cancer Haven in Titchfield and The Murray Parish Trust. Wednesday 22nd November - Attended Hogwarts In The Snow. Photos are here, here and here. Monday 4th September - Attended TV Choice Awards at the Dorchester Hotel, London. Friday 11th August - Watched Groundhog Day on Broadway. Photos of him with cast members are here, here and here. John Barrowman and Catherine Tate also attended. Thursday 20th and Friday 21st July - David Tennant attended San Diego Comic-Con. On the Thursday it was for Call Of Duty WWII Zombies Mode and on Friday it was for DuckTales. Sunday 16th July - Watched the 2017 Wimbledon Men's Tennis Final (Photos). Monday 10th July - Attended the Press Night of The RSC's Queen Anne play at the Theatre Royal Haymarket in London. Sunday 9th April - London screening and panel of Mad To Be Normal. Friday 7th April - David Tennant was one of the models for Sky Arts Portrait Artist Of The Year at the Wallace Museum. Photo and more photos. Wednesday 8th March - Attended the Press Night and After Party of Donmar Warehouse's play Limehouse in London. Photos. Sunday 26th February - Premiere of Mad To Be Normal at the Glasgow Film Festival. Wednesday 22nd February - Presented the award for Best British Female Artist to Emeli Sand� at The Brit Awards at the O2 Arena in London..
Monday 30th January - Attended the Broadchurch Series Three press screening in London. Thursday 17th November - Watched the Press Night of The Tempest at The RSC in Stratford-upon-Avon and attended the aftershow party. Photos here and here. Saturday 15th October - Presented an award at the London Film Festival Awards. Tuesday 4th October - Attended the Press Night and after show party for Boys In The Band. Sunday 25th September - Judged the Chiswick House Dog Show. Sat 6th August - Watched Paapa Essiedu in Hamlet for The RSC. Photo. Tues 5th July - Receiving an honorary degree from the Royal Conservatoire Of Scotland. Mon 4th July - Royal Conservatoire Of Scotland panel. Friday 18th December - David Tennant stars in the Absolute Radio Breakfast Show pantomime. Friday 4th December - Jessica Jones panel at Comic Con Brazil. Sat 28 Nov - David Tennant was a judge at the charity event Strictly Charity. Photo at this link. Tuesday 17th November - David Tennant attended the Jessica Jones premiere in New York City. Tuesday 17th November - David Tennant was interviewed by AOL Build. Photos were posted to Tumblr. Monday 16th November - David Tennant was interviewed by HuffPostLive. Tuesday 10th November - David Tennant co-hosted the Absolute Radio Breakfast Show. Friday 16th October - David Tennant recorded a pilot episode of Time Machine (in Studio 16) hosted by Richard Osman for Channel 4. 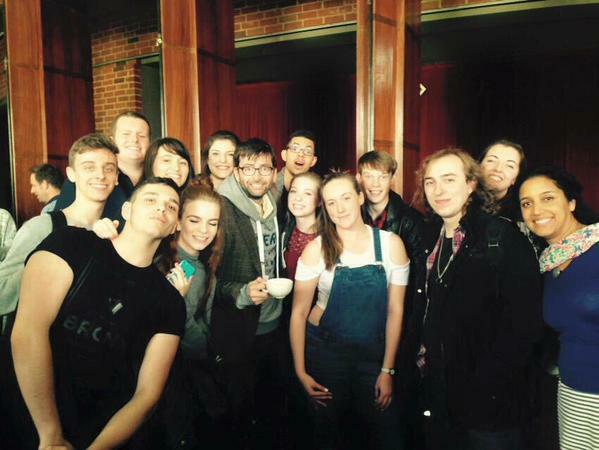 Thursday 24th September - David Tennant presented certificates and attended an event for RSC Education in Stratford-upon-Avon. A photo of him with students was posted to Twitter. David won the Best Actor Award and Broadchurch won Best Drama Series Award. Saturday 25th July - Hollywood Foreign Press Association Golden Globes press conference and then Marvel's Jessica Jones wrap party at the Wythe Hotel in Brooklyn, New York. Saturday 9th and Sunday 10th May - Wizard World Fan Convention, Philadelphia, PA.
Billie Piper also attended on the Saturday. Saturday 25th April - The White House Correspondents' dinner in Washington, DC. Saturday 14th and Sunday 15th March - Wizard World Fan Convention, Raleigh, NC. Tuesday 10th March - David Tennant attended an event at 10 Downing Street for Comic Relief which was hosted by the Prime Minister David Cameron. David Walliams also attended and read his book The Queen's Orang-utan which is being sold to raise money for the charity. David won the Best Actor In A Play Award. Tuesday 26th January - David Tennant attended the Radio Times Covers Party in London. Photos of him at the annual event have been posted to Tumblr and Daily Mail has some paparazzi photos of him leaving. Radio Times posted a David Tennant video interview from it about A.K.A. Jessica Jones and Broadchurch. Friday 23rd January - David Tennant recorded the radio panel show Just A Minute. David presented the Drama Award and received the Special Recognition Award. David Tennant and Olivia Colman recorded the interview which was broadcast on BBC One the next day. David Tennant co-hosted the breakfast show with Christian O'Connell from 6am to 10am. MP3s and info about David Tennant on Absolute Radio. Monday 17th November - Visited a school in Port Glasgow. Sunday 16th November - BAFTA Scotland Awards Ceremony in Glasgow. Tuesday 30th September - Gracepoint screening in Los Angeles. Monday 22nd September - What We Did On Our Holiday premiere in Leicester Square, London. Sunday 20th July - Television Critics Association Summer Press Tour Gracepoint panel in Beverly Hills, CA. Tuesday 8th July - Attended Richard III Press Night at Trafalgar Studios, London. The play stars Martin Freeman. Monday 30th June - Attended Billie Piper's Press Night for Great Britain at the National Theatre in London. Saturday 28th June - Watched Wimbledon and was shown on BBC television. Thursday 19th June - RSC Press today tweeted that David Tennant was spotted at the Aldwych Theatre in London watching Wolf Hall. Monday 12th May - Fox TV Fan Front and Upfront in New York City. David Tennant performed in their Christmas Pantomine which had the theme Zombie Claus. David Tennant attended this event in aid of the Multiple Sclerosis Society. The three Nick's were Nik Kershaw, Nick Beggs and Nick Heyward. David Tennant presented Richard Wilson with an Outstanding Contribution to Television and Film at BAFTA Scotland in Glasgow. A photo of David has been posted to Twitter. The video has been posted to YouTube. David's part starts at 15 minutes. BAFTA Scotland website has more photos of David Tennant at the event. Sunday 29th September - Doctor Who BFI screening at 2pm of The Stolen Earth and Journey's End. Monday 23rd September - Attended Sunshine On Leith screening. Monday 15th September - Attended Press Night of Barking In Essex starring Lee Evans. Monday 9th September - TV Choice Awards. Tuesday 27th August - rehearsals start for Richard II. Friday 15th March - Comic Relief on BBC One. Thursday 28th February - watched Macbeth at Trafalgar Studios, London starring James McAvoy. Tuesday 19th February - Screening and Q&A about Broadchurch at BAFTA, London. David Tennant was seen at the Old Bailey this afternoon presumably doing some preparation work for The Escape Artist. Nigel Lindsay has tweeted that he was also at the Old Bailey with David Tennant this afternoon. David Tennant posed for photos for some people in the bar of the Cottesloe Theatre in the National Theatre tonight. David was at the theatre to watch Billie Piper in The Effect. Photos of him were tweeted here and here. David Tennant attended the Project Motor Mouth Charity Convention at the Copthorne Hotel in Slough, Berkshire. Photos and talk details from the Project Motor Mouth Charity Convention . David Tennant co-hosted the Absolute Radio Breakfast Show and performed in their Nativity play. David Tennant attended the Midnight Fan Convention at the Hilton Metropole Hotel in Birmingham. This link has more information about David Tennant at the Midnight Convention. Stephen Fry tweeted that David Tennant watched the matinee performance of Twelfth Night at the Apollo Theatre in London today. The play stars Mark Rylance. Artist Daniel Lismore tweeted a photo of David Tennant backstage. David Tennant is attending the ITV Upfronts event. ITVMedia have tweeted a photo of David and confirmed that Broadchurch will air in early 2013. ITV have posted a new photo of David Tennant at the ITV Upfronts event, plus a write-up about the evening. Tuesday 13th November - Premiere of Nativity Two Danger In The Manger! David Tennant attended the premiere of Nativity Two Danger In The Manger! at Empire, Leicester Square, London. 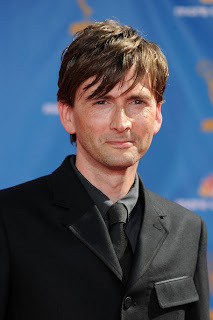 David Tennant filmed the final of Comedy World Cup at Teddington Studios near London. David Tennant read an extract from Midsummers's Night Dream at Helen Scott Lidgett's memorial in London according to Sarah Brown (and others). David Tennant attended the Press Night of A Chorus Of Disapproval in London. Getty Images has some photos. David Tennant filmed the fifth and sixth episodes of Comedy World Cup at Teddington Studios near London. David Tennant filmed the third and fourth episodes of Comedy World Cup at Teddington Studios near London. David Tennant attended the Lords Of Time Fan Convention at the Hilton Metropole Hotel in Birmingham. David Tennant filmed the first two episodes of Comedy World Cup at Teddington Studios near London. David Tennant filmed the pilot of Comedy World Cup at RADA Studios in London. David Tennant attended The 2012 Television Critics Association Sumer Tour in Beverley Hills. This was to promote The Spies Of Warsaw. A MP3 of the interview by Janice Forsyth with David Tennant which was broadcast on BBC Radio Scotland today. David Tennant attended the cast read-through of The Spies Of Warsaw at the Swiss Church in London. 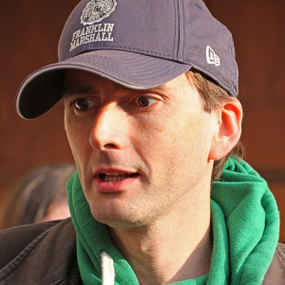 David Tennant has been spotted by several people filming in Soho Square this lunchtime for BBC Television. A photo of him has been posted online here. In the evening David Tennant saw the comedy The Ladykillers at the Gielgud Theatre in London starring Peter Capaldi. David Tennant ran the Sport Relief Mile and was interviewed on television both before and after the run. Kermode and Mayo's Film Review Show today on Radio 5 Live. David Tennant on The Christian O'Connell Breakfast Show on Absolute Radio. David Tennant on The Chris Moyles Show on BBC Radio One. Today was a day of press interviews for David Tennant. Premiere of The Pirates! In An Adventure With Scientists movie at the Mayfair Hotel in London. Friday 9th March - The One Show. Saturday 3rd March - Let's Dance For Sport Relief. Monday 27th February - filming. Wednesday 15th February - Singing In The Rain Press Night. David Tennant attended the Press Night for the musical Singing In The Rain at the Palace Theatre. Dan Wooller photographed David Tennant with Sandra Dickinson at the After Show Party at Freemason�s Hall in London. What�s On Stage has also an item about the Press Night. Getty Images has 3 more photos of David Tennant at the Singing In The Rain Press Night. Children In Need Rocks Manchester concert - 17th November (co-host). Celebrity Autobiography - 6th and 7th October. Click here to see a photo of David Tennant at the All My Sons Press Night on 27th May 2010. 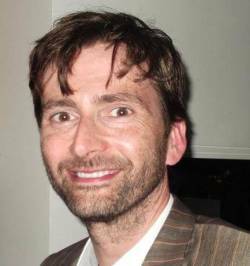 Also Tennantively.org has two photos of David Tennant from it too. Click on the pictures for large versions.